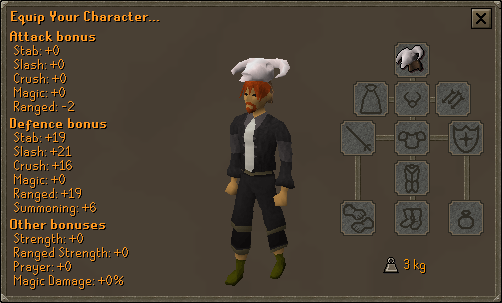 Help the Odd Old Man collect a series of odd bones found from creatures around RuneScape! Begin by speaking to the Odd Old Man who is located to the far northeast of Varrock and south west of the River Salve Temple. 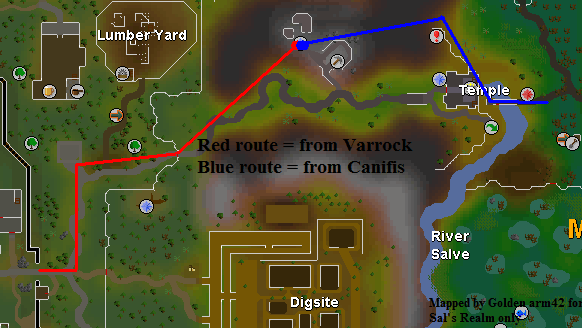 If you are at Varrock then you can take the red route, or if you are at Canifis you can take the blue route to start the quest. Once you are there talk to the Odd Old Man (who is carrying a big sack of bones). You will ask him what he is doing, and why he is all the way out there. The Odd Old Man will reply that he is an archaeologist and is collecting bones. Also he mentions he has some broken bones and wants you to replace them by getting some new ones. But as you are talking to him you hear the sack of bones on the odd old man's back mumbling. The Odd Old Man asks you to collect different kinds of bones for him, that is: Goblin skull, bear ribs, big frog leg, ram skull, unicorn bone, monkey paw, giant rat bone and a giant bat wing. After he has told you to retrieve the bones, it is advised to teleport to Lumbridge because it will get you a: goblin skull, ram skull, then cross the bridge and walk north toward Varrock for a unicorn, bear and giant rat. This is a very short trip for 5 out of 8 bones. To get goblin bones just simply kill a goblin and it will drop a goblin skull, pick it up. The best place to kill a goblin is at the Lumbridge goblin house east of the town. To get some bear ribs all you need to do is kill a bear and it will drop some bear ribs, pick them up. Similar situation for unicorn bones. There are different places to kill bears, but it is recommended to kill them south of Varrock at the south-east mine. 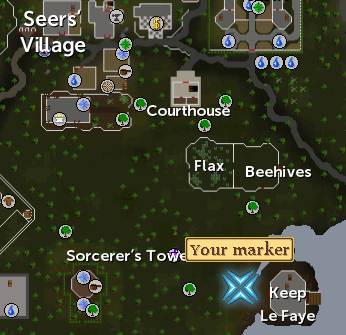 You should teleport to the Varrock lodestone and walk east until you find them. While you are there, kill one of the unicorns in the area for some unicorn bones. To get a frog leg you simply kill a big frog (NOT a giant frog!) and it will drop a big frog leg, pick it up. 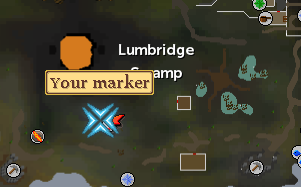 Big frogs are located in the Lumbridge Swamp Caves. 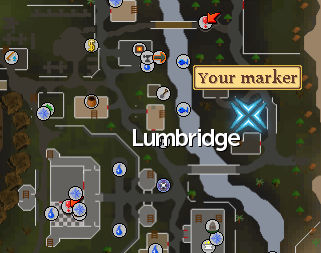 To start, you should teleport to Lumbridge. The easiest way requires the beginning of the Lost Tribe Quest. Head down to the Lumbridge basement and squeeze through the hole in the eastern wall. Now head south and squeeze through the next hole. Now just head south until you find the Giant Frogs. 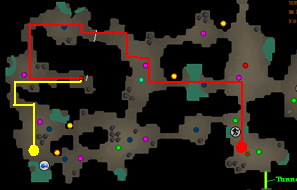 The second way (for those that have not started the Lost Tribe) is to go through the Lumbridge Swamp Caves in Lumbridge Swamp, as seen on the map. For this method you will need a spiny helmet unless you want to be viciously attacked by wall beasts. Note: Before you go here do not forget a light source and spiny helmet. To get a hold of a ram skull all you have to do is kill a ram, and it will drop a ram skull, pick it up. 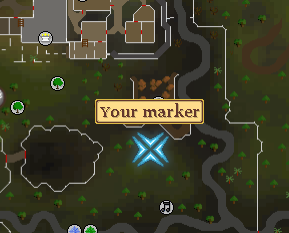 For killing Rams, it is recommended that you head to the location north of the Edgeville Monastery. Use the Edgeville lodestone teleport spell and walk a few steps west to find the rams. 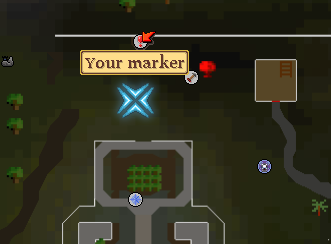 If you have not unlocked this spell yet, try killing a ram in the northern Lumbridge sheep pen. To get a monkey paw all you need to do is kill a monkey, and it will drop a monkey paw, pick it up. The best place to kill monkeys I would say is at Brimhaven or Musa Point (Karamja). The easiest way to get to the monkey location is to use the Karamja lodestone teleport and walk northwest until you find a monkey. Alternatively, you could take a ship. 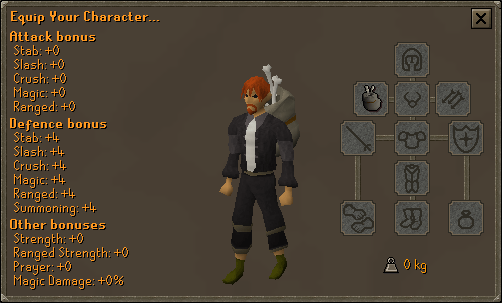 To charter one from Ardougne, teleport there and walk south east to Barnaby the ship sailor and pay him 30gp to board the ship. The ship will then take you to Brimhaven; start walking south east and you should see some monkeys. Lower leveled players should watch out for the aggressive level 86 tribesmen. To get a hold of a giant rat bone you have to kill a giant rat, when you kill the giant rat it will drop a giant rat bone, pick it up. The best option is to use Lumbridge Teleport or Home Teleport, and then kill the Giant Rats south of the Lumbridge Graveyard. Another place to kill giant rats is within the Varrock Sewers. 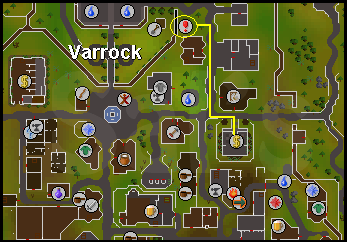 It is easy to get there, as you can teleport to Varrock and walk north west to the Varrock Sewers entrance; go down the ladders into the sewers and you should see some giant rats. To get a giant bat wing you simply just have to kill a giant bat, when you kill the giant bat it will drop a giant bat wing, pick it up. One of the best places to kill giant bats is outside of the Keep Le Faye, which is located south east of Camelot. To get there all you need to do is teleport to Camelot and go south east to Keep Le Faye. Giant bats are also found at the coal trucks. You can also go to take the ship to Karamja which costs 30gp, and go to the Karamja Volcano as there are bats there too. Once you have collected all of the above bones, go to Draynor Village by either walking there or teleporting to Lumbridge and walking west. When you get there talk to a man called Fortunato and ask him if he has any vinegar. At first he will say "Vinegar? Vinegar!" then you tell him the Odd Old Man sent you, after that he will be happy to sell you some. Grab about 8 jugs of vinegar. Before you go back to the Odd Old Man grab a tinderbox, pot, 8 logs, your 8 jugs of vinegar and your 8 bones. Now head back to the Odd Old Man. 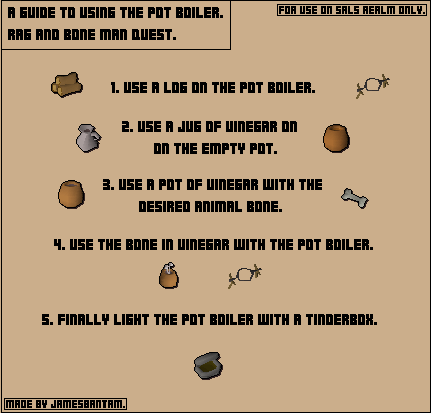 When you get back to the odd old man, use your logs with the pot-boiler that is on the floor next to the Odd Old Man, then use your jug of vinegar with the pot (the pot in your inventory), then put one of your 8 bones into the pot and put the bone-in-pot onto the pot-boiler which is on the floor and finally use your tinderbox with the pot-boiler. Wait for your bone to boil in the pot and then remove the pot from the pot-boiler. You now have one clean bone! Repeat this process until you have boiled all of your bones. After you have boiled all of your bones give them to the Odd Old Man. He will will be grateful and will say that he cant wait to see the bones in the museum, he will also ask you to bring him some more bones but from different creatures, once you have them bring them to him. Congratulations, quest complete! Just behind the Odd Old Man is a wish list of other bones that he would like you to get for him. Collect them and bring them back to the Odd Old Man to receive another reward! 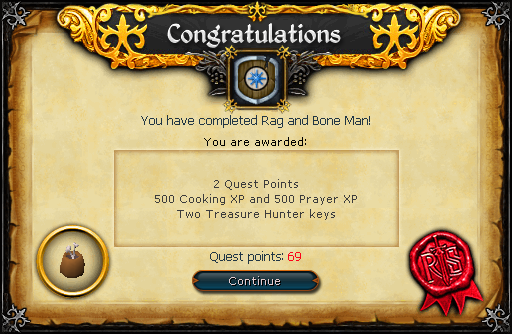 Most bones are pretty easy to find there are a few snags though: Certain bones need either quests finished or at least started and others need a certain slayer level. Ice Giant bones: Kill the Ice Giants on White Wolf Mountain or in the Ice Dungeon near Thurgo. Terror Bird bone: Only the non mounted variety works, they can be found in the fenced off area at the western side of the Gnome Stronghold across the bridge. Vulture: Found near the Agility Pyramid. Zombie bones: Only zombies dropping other things than bones will drop the required bone. Rabbit: On Miscellania otherwise you would need Underground Pass to enter Isafdar, or at least started Fairy Tale II - Cure a Queen and use the fairy ring code BKQ. You then are given the choice in the reward: Either a Ram's Helmet or a Bonesack similar to the one the Odd Old Man carries (it is worn like a cape). Either a Bonesack or Ram Skull Helmet according to your choice. If you lose any of them, you can get a free replacement from the Odd Old Man. You can also speak to him to swap the items.